Dentistry has evolved from using a simple tooth pick to the today's state-of-the-art technology. Intraoral cleaning devices have been a part of human civilization since long. A strong correlation exists between the severity of gingivitis and periodontitis and the accumulation of dental plaque. The modern toothbrush was invented by Chinese during the Tang Dynasty. Since then, the toothbrush has undergone a lot of change in every aspect, other than the purpose of its action, which has essentially remained the same, that is, to attain a plaque free tooth surface. This in turn would help prevent the initiation and progression of gingival and periodontal disease. Various chemical and mechanical methods have been advocated for this purpose; however, tooth brushing still remains as the most commonly used, effective and safe therapeutic method to remove plaque. It has been shown that tooth brushing practiced by the majority of the population is unsatisfactory. Studies have suggested that an average person removes only about 50% of the plaque present on teeth. The development of a toothbrush that would allow an average person to remove more plaque from their teeth on a daily basis is highly desirable. In an attempt in this direction, two innovative toothbrushes, PM-TC Sonic® (Proton Magnesium Tooth Clean) toothbrush and Oral-B® , D4 battery powered toothbrush have been launched in the market. Both these brushes are very different in every aspect, such as, size, basic shape and mechanism of action though they have the common objective of thorough plaque control. 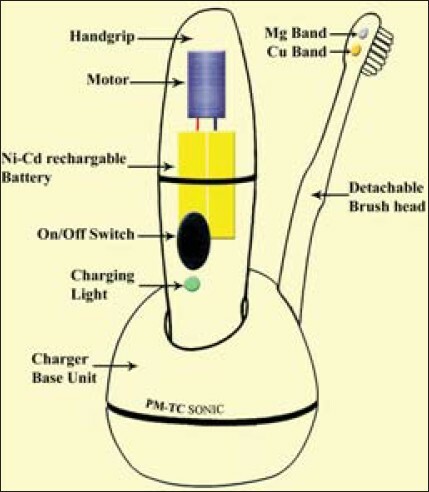 The PM-TC Sonic® (Kagoshima Supersonic Technical Laboratory, Kagoshima, Japan) toothbrush has been developed combining the rapid vibrations of the bristles with production of a small electrical current in the oral cavity. The working mechanism of this brush, according to the manufacturer, is as follows: A small current is produced with the help of two strips, one each of copper and magnesium, placed at the back of the brush head. These two strips act as electrodes and the saliva present in the oral cavity acts as an electrolyte for the reaction to take place. 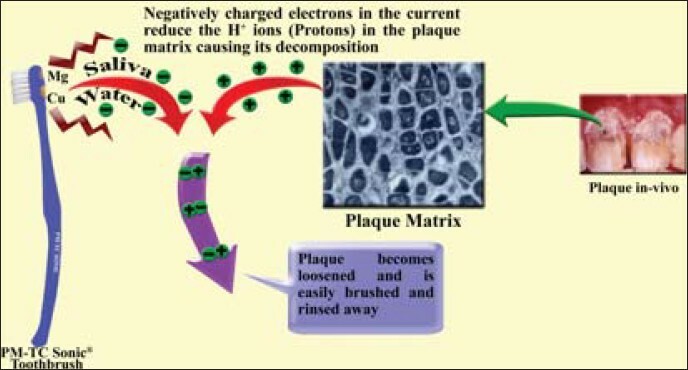 Acting like a magnet, the negatively charged electrons in the current attract the positively charged ions in the plaque. This reaction results in the reduction of H + ions (Protons) from the organic acid in the plaque matrix causing its decomposition. The plaque is loosened by the combined effect of mechanical vibrations and production of a small current in the oral cavity, and is easily brushed and rinsed away. 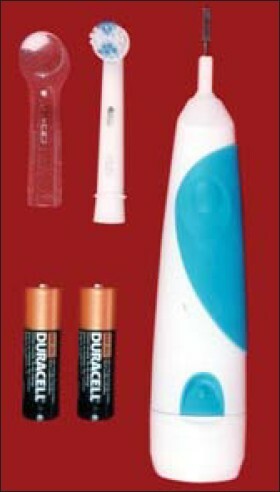 One more development in the toothbrush technology is the battery operated toothbrush, Oral-B® D4010. The ultra speed oscillations of the brush head lead to production of acoustic vibrations and cavitational phenomenon that help to dislodge the bacterial plaque from the tooth structure. These phenomena may help in removing stains, and are claimed to be effective in bacterial cell wall disruption as well. The purpose of the present clinical study was to clinically evaluate and compare the efficacy of an electrically active sonic toothbrush and an oscillating/rotating powered toothbrush in the reduction of established plaque and treatment of gingivitis. The PM-TC Sonic® toothbrush [Figure 1] is a soft multitufted toothbrush that vibrates at 75 cycles per second generating 10,500 strokes per minute, in a 4-way elliptical motion [Figure 2]. The brush has a rippled trim profile. It is powered by a nickel-cadmium (Ni-Cd) rechargeable battery placed inside the brush handle. The two small strips, one each of Copper and Magnesium, placed at the back of the brush head, react with water / saliva to produce a potential difference of 1.8V with a current of 2000 μA [Figure 3]. The Oral-B® D4 toothbrush is also a soft multitufted toothbrush that vibrates at 160 cycles per second generating 9600 strokes per minute [Figure 4]. The brush head shows a bi-directional movement i.e. rotation and oscillation [Figure 2]. It is powered by two alkaline AA size batteries. The cup shaped brush head has a diameter of 13 mm with the bristle tufts placed in 3 circular rings. Subjects with good general and oral health. Subjects who had not received any periodontal therapy for past 3 months. Subjects with moderate gingivitis (at least 25% of test sites showing bleeding on probing). Ability of the subjects to attend the hospital at recall intervals. Subjects with full complement of teeth present except third molars. Subjects with poor manual dexterity. Subjects taking drugs that could affect the state of the gingival tissues. Subjects with five or more carious teeth that require immediate treatment. Subjects using any other supplemental plaque control measures like interdental cleansing aids or mouthwashes. Subjects with the habit of taking alcohol, smoking or chewing tobacco. This randomized, single-blind clinical trial was conducted for a period of 60 days. All the clinical parameters were recorded at baseline (0 day), 15 th day, 30 th day, 45th day and 60th day. Instructions and pamphlets regarding the method of brushing technique, handling and manipulation of both the brushes were given, and a commercially available fluoridated dentifrice (Pepsodent® Regular) was provided to the participants for use throughout the study. After explanation of the purpose and duration of the study, all the subjects voluntarily signed to give an informed consent for participating in the study. Approval from the ethical committee of the institution was taken prior to the commencement of the study. All variables were scored at four sites per tooth: mesio-vestibular, vestibular, disto-vestibular, and palatal / lingual. The participants were asked to brush their teeth twice daily for at least 3 minutes during the time period of the study using only their assigned toothbrush and dentifrice. Subjects were not allowed to use other dental products or interdental cleaning aids during the study. They were instructed not to brush their teeth 24 hours prior to their appointment at baseline, 15 th day, 30 th day, 45 th day and 60 th day. The student volunteers were recalled after every 15 days till the end of the study. During each recall visit, all the four clinical parameters were recorded and oral hygiene and other instructions were reinforced. All examinations were performed by the same examiner under the same conditions. At the time of examinations, the examiner was unaware of the brush type used by the subject. At each assessment within the experimental period, safety was checked by examining the hard and soft oral tissues for signs of oral pathology. All areas were assessed and reported as normal or abnormal for each patient. Compliance and comments about the brushes were determined by a questionnaire at the end of the study. Five parameters namely enjoyment, sound, vibration, feeling of cleanliness and bristle stiffness were evaluated using the visual analog scale (VAS) in which 0 was the worst choice and 10 was the best choice. Data for all the clinical parameters were entered into a previously made proforma and subjected to statistical analysis. Full mouth mean plaque, bleeding and gingival indices were calculated. Intragroup statistical analysis was carried out by Paired t test. Intergroup statistical analysis was carried out by Unpaired t test. Data concerning the questionnaire using VAS-scale were analyzed using the Mann-Whitney test. A P-value of < 0.001 was considered statistically highly significant, while P values of < 0.05 were considered statistically significant. All the 40 subjects successfully completed the study period of 60 days. There were no dropout cases and all the subjects maintained their recall appointments. All baseline indices appeared well balanced. The mean Modified Gingival Index (MGI) at baseline was 1.67 ± 0.23 for the PM-TC group, which was reduced to 1.17 ± 0.06 at the end of the study. For the second group (Oral-B), mean MGI at baseline was 1.68 ± 0.18 for the PM-TC group, which was reduced to 1.16 ± 0.05 at the end of the study (Graph 1). The overnight plaque score also decreased from 1.70 ± 0.18 to 1.20 ± 0.05 for PM-TC group, and from 1.78 ± 0.21 to 1.17 ± 0.04 for Oral-B group (Graph 2). The mean gingival bleeding index (GBI) at baseline was 43.0 ± 4.2 for the PM-TC group which was reduced to 27.6 ± 3.6 at the end of the study. For the Oral-B group, the mean GBI showed a reduction from 41.9 ± 7.0 at baseline to 26.4 ± 3.5 at the end of the study (Graph 3). All the clinical parameters showed a significant reduction from the baseline to the end of the study. The overall mean reductions are presented in [Table 1]. [Table 2] shows the results from the questionnaire based on VAS. The parameters were evaluated using the Mann-Whitney test. For all the parameters evaluated based on the VAS, the difference was found to be statistically non- significant (P > 0.05) (Graph 4). No adverse events were noted by the examiner or reported by the subjects. At each assessment within the experimental period, safety was checked by examining the hard and soft oral tissues for signs of oral pathology. All changes noted during the oral cavity examinations were recorded on the case sheet form. All the clinical parameters showed an increased reduction from the baseline to the 15 th day as compared to other recall intervals. This may be attributed to gradual reduction of the initial 'novelty effect'  and / or Hawthorne effect. 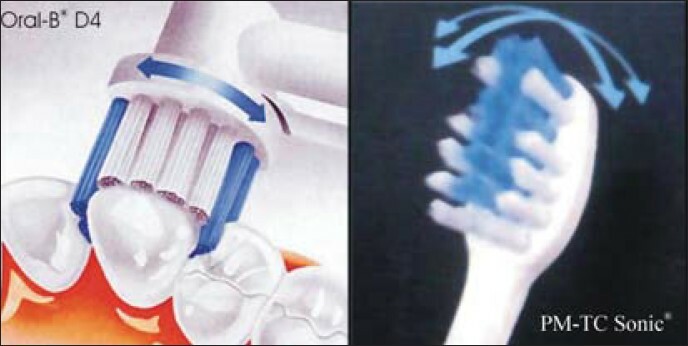 The marginally better results shown by the Oral-B® D4 group can be explained by the presence of a unique small cup shaped brush head that makes it easy to use, and the fact that is less noisy, thus encouraging its use. The parameters evaluated by the questionnaire included enjoyment, sound, vibration, feeling of cleanliness and bristle stiffness. Majority of the subjects preferred the Oral-B® D4 over the PM-TC Sonic® toothbrush. The questionnaire indicated that the sound produced by the PM-TC Sonic® brush was an annoying negative factor. Analysis of the questionnaire revealed that there were clear differences in subject perception of the two brushes. Designing a short term clinical study to test the efficacy of plaque removal is not an easy task. Different factors such as frequency, duration, technique, thoroughness of tooth brushing, manual dexterity, motivation, type of dentifrice used, regularity of subjects and the novelty effect, may interfere with the results. The present study design was developed in order to minimize the effects of these variables as much as possible. Based on the present data, the Oral-B® D4 toothbrush may be assigned as the better toothbrush as compared to the PM-TC Sonic® toothbrush; however, the difference between the two is statistically insignificant. The results of this study demonstrate that both the toothbrushes have a great potential to remove plaque and reduce gingivitis effectively. The evaluation of the parameters at all the intervals showed a highly significant plaque reduction for both the toothbrushes. Both were effective in controlling plaque and reducing gingivitis during the study period. No added beneficial effect of the 'electrically active design feature' was observed as compared to the oscillating/rotating toothbrush. According to VAS questionnaire, the Oral-B® D4 was preferred by the subjects more than the PM-TC Sonic® toothbrush. Overall, Oral-B® D4 was shown to be marginally more effective than the PM-TC Sonic® toothbrush. Both the brushes are safe and effective when used unsupervised on regular basis for the removal of human dental plaque. We thank Kagoshima Supersonic Technical Laboratory, Kagoshima, Japan, and Gillette India Ltd for providing the toothbrushes used in the study. 1. Loe H, Theilade E, Jensen SB. Experimental gingivitis in man. J Periodontol 1965;36:177-87. 2. Rosema NA, Timmerman MF, Versteeg PA, Van Palenstein Helderman WH, Van Der Velden U, Van Der Weijden GA. Safety and efficacy of two manual toothbrushes. Int J Dent Hyg 2010;8:280-5. 3. de la Rosa M, Zacarias Guerra J, Johnston DA, Radike AW. Plaque growth and removal with daily toothbrushing. J Periodontol 1979;50:661-4. 4. Turesky S, Gilmore ND, Glickman I. Reduced plaque formation by the chloromethyl analogue of victamine C. J Periodontol 1970;41:41-3. 5. Lobene RR, Weatherford T, Ross NM, Lamm RA, Menaker L. A modified gingival index for use in clinical trial. Clin Prev Dent 1986;8:3-6. 6. Ainamo J, Bay I. Problems and proposals for recording gingivitis and plaque. Int Dent J 1975;25:229-35. 7. Forgas-Brockmann LB, Carter-Hanson C, Killoy J. The effect of an ultrasonic toothbrush on plaque accumulation and gingival inflammation. J Clin Periodontol 1998;25:375-9. 8. Niwa M, Fukuda M. Clinical study on the control of dental plaque using a photo energy conversion with a toothbrush equipped with a TiO 2 semiconductor. Shigaku 1989;77:598-606. 9. Weiger R. "Denta-Solar" - clinical study of new toothbrush with integrated TiO 2 semi-conductor. Oralprophylaxe 1988;10:79-83. 10. Hotta M, Aono M. A clinical study on the control of dental plaque using an electronic toothbrush with piezo-electric element. Clin Prev Dent 1992;14:16-8. 11. Galgut PN. Efficacy of a new electronic toothbrush in removing bacterial dental plaque in young adults. Gen Dent 1996;44:441-5. 12. Heasman PA, Stacey F, Heasman L, Sellers P, Macgregor ID, Kelly PJ. A comparative study of the Philips HP 735, Braun/Oral B D7 and the Oral B 35 Advantage toothbrushes. J Clin Periodontol 1999;26:85-90. 13. Sharma NC, Galustians HJ, Qaqish J, Cugini M, Warren PR. The effect of two powered toothbrushes on calculus and stain formation. Am J Dent 2002;15:71-6. 14. Bradley DJ, Christopher M. Clinical evaluation of the efficacy and safety of a new sonic toothbrush. J Periodont 1994;65:692-7. 15. Cronin MJ, Dembling WZ, King DW, Goodman D, Cugini M, Warren PR. A clinical study of plaque removal with an advanced rechargeable power toothbrush and a battery-operated device. Am J Dent 2002;15:365-8. 16. O'Beirne G, Johnson RH, Persson GR, Spektor MD. Efficacy of a sonic toothbrush on inflammation and probing depth in adult Periodontitis. J Periodontol 1996;67:900-8. 17. Ash MM Jr, Rainey BL, Smith WA. Evaluation of manual and motor driven toothbrushes. J Am Dent Assoc 1964;69:321-5. 18. Jeffcoat MK. Principles and pitfalls of clinical trials design. J Periodontol 1992;63(12 Suppl):1045-51. 19. McCracken GI, Janssen J, Steen N, DeJager M, Heasman PA. A clinical evaluation of a novel data logger to determine compliance with the use of powered toothbrushes. J Clin Periodontol 2002;29:838-43.